1 pc. 5,50 EUR ea. from 3 pcs. 4,92 EUR ea. from 10 pcs. 4,40 EUR ea. from 20 pcs. 4,15 EUR ea. from 40 pcs. 3,92 EUR ea. 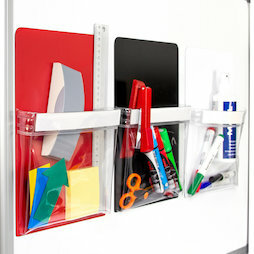 The magnetic bag in A4 format is the perfect organiser for the office, workshop, warehouse, or kitchen. Thanks to the transparent, soft plastic bag, you always see what's inside. The bag is attached to a magnetic sheet that makes it adhere to magnetic surfaces. The white cardboard strip underneath the bag opening can be removed and labelled, which allows for a better overview, especially when several of our magnetic bags are used in the same place. 1 pc. 4,11 EUR ea. 1 pc. 4,02 EUR ea. 1 pc. 3,54 EUR ea. with foil coating and sheet protector, A4 format, not magnetic! 1 pc. 4,22 EUR ea. 1 pc. 18,98 EUR ea.